Air Plants, also known as Tillandsias, are one of the easiest to maintain plants that can be used for decking up both outdoors as well as indoors. These plants, unlike usual indoor plants do not require daily watering, and, most importantly soil. Yes, air plants can grow without soil. These plants derive their nutrients from air, and hence the moniker – Air Plants. 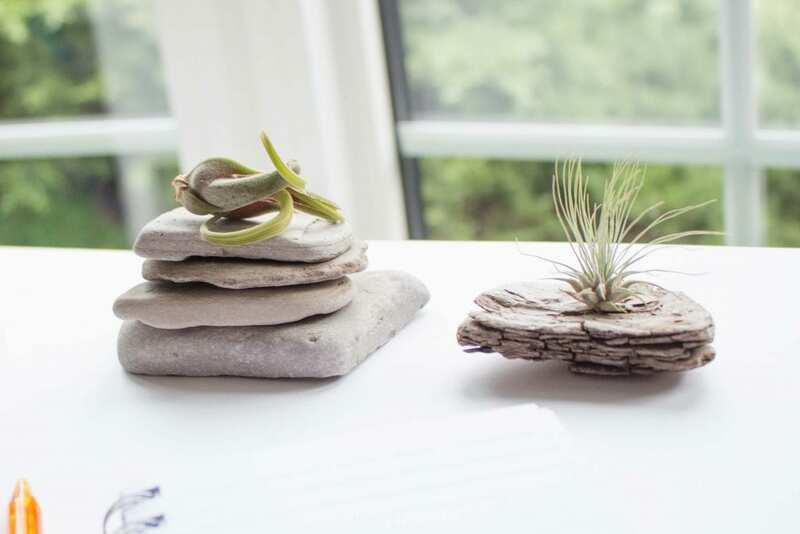 You can grow these small and cute plants anywhere, ranging from pebbles, wooden frames, driftwood vases, rocks, terrariums and can be displayed, either as table decorations, or also as hanging plants. Today, we are going to show 55 eye grabbing air plant display ideas that will blow your minds away. So, for the most creative ride of the century, please go through this post and pick your favorite! These cuties can be placed anywhere to add a dash of freshness. This is a very easy project, and can be done at home if you are a firm believer of DIY. Get some old engine springs and use these as holders for your air plants. The engine spiral air plant display looks really eye grabbing. There is a certain rustic charm about using driftwood for indoor decorations, and, when you couple it up with attractive air plants, the ‘charm-o-meter’ seems to rise up and up! 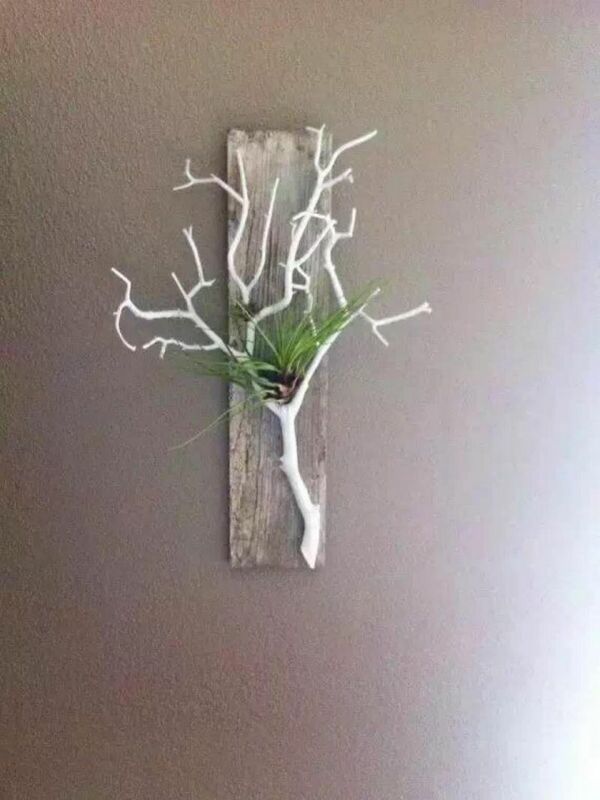 Seen in the image above is a pretty looking driftwood centerpiece that has been converted into an air plant holder. 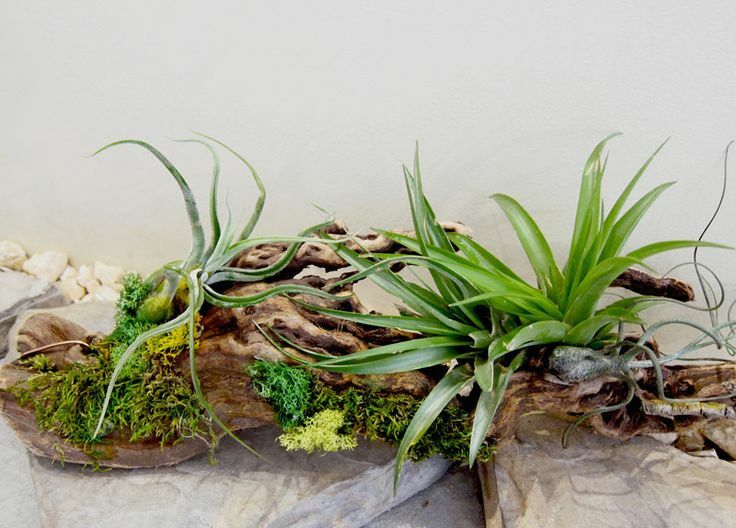 You can simply place air plants in the various dented spots in the driftwood along with moss and other elements. 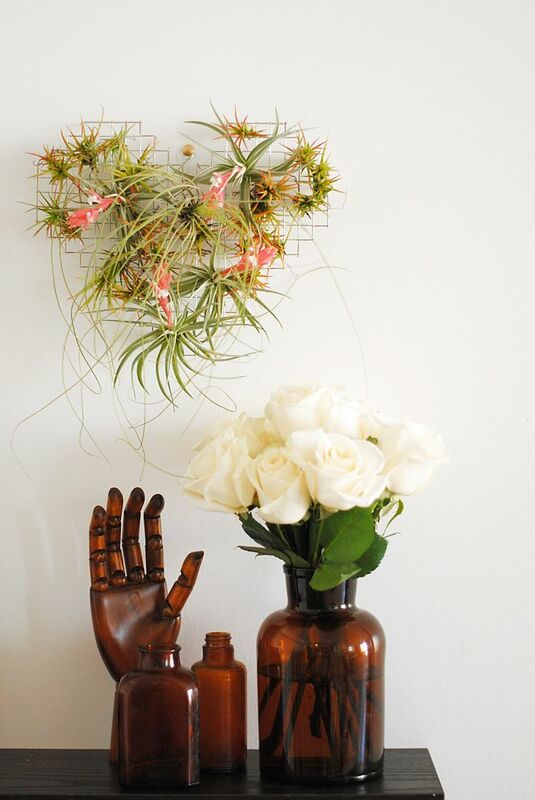 There are umpteen gorgeous air plant holder ideas such as the one showcased here. These colorfully painted pots are perfect for planting air plants, and can increase the style quotient of any room in an instant. These pots can either be hand made, or, can also be bought from stores. The pots in the image have been crafted by a company known as Bird and Feather. Wood has always been a favorite when decking up exteriors as well as interiors of houses. These lend a rustic as well as natural look to any corner. 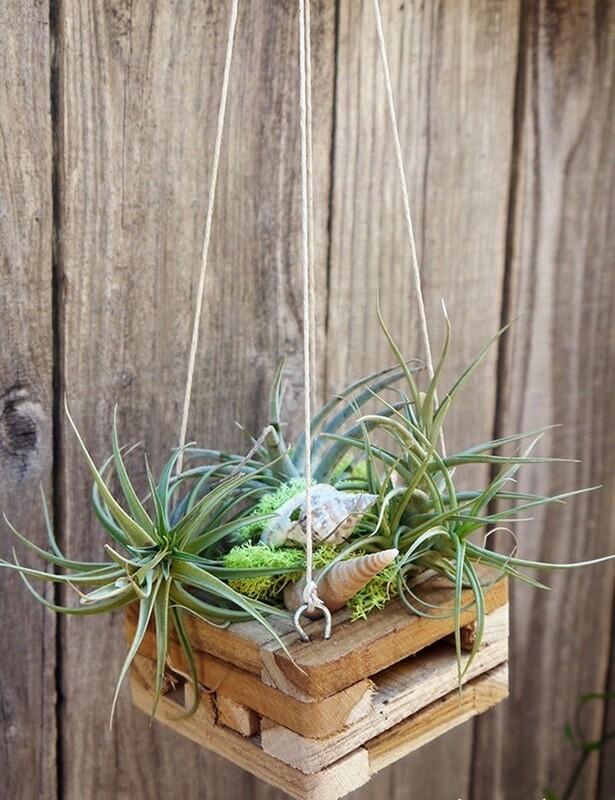 The wooden air plant holders in the image look adorable, and anyone can make these easily. All you need are a few ‘all natural’ wooden chunks or pieces, with barks intact, and then, plant your air plants in them. You don’t need any polishing if you want a rustic tone. These wooden holders extend a warm look to the wall. These pots are completely hand crafted. 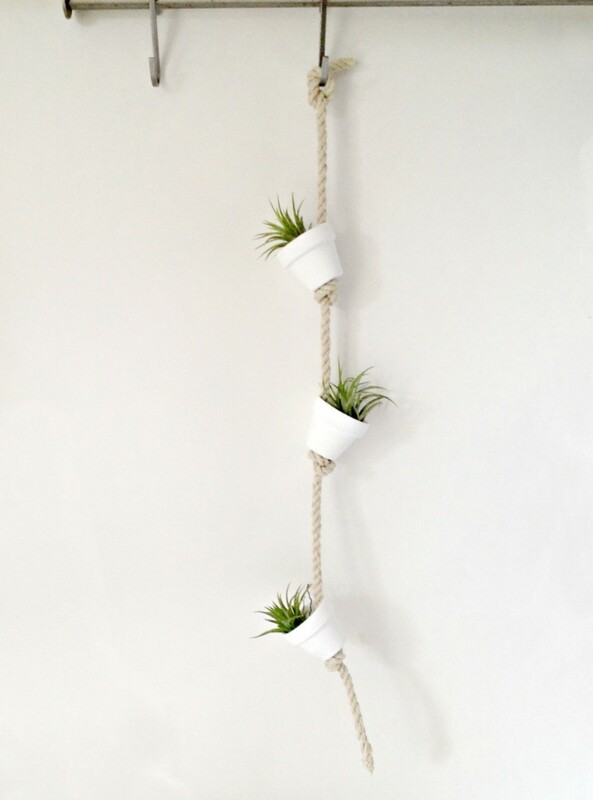 This is a simple DIY project for which you will need air plants, a few tiny clay pots and hemp rope for hanging. Start by buying clay pots from any store, then, drill holes in them so as to hang these from the hemp rope. Paint these white or in any other shade as you wish. Now, place air plants in each of the pots. Make a string of these potted planters and then hang from a rack or ceiling. Ceramic pots and planters are perfect additions to any decor, either outdoors or indoors. The picture above shows a stunning example of a ceramic air plant display holder bearing modern or contemporary tones. The pot is available in most online shops and is handcrafted using stoneware clay in white. These types of pots are usually made by potters and can be given any shape. The above showcased glossy ceramic pot looks very exquisite and can hold any specie of air plant. It’s perfect for placing on walls or even tables. There are so many experiments one can do with air plant decoration ideas like you haven’t imagined before. One such cool idea is to use natural driftwood spheres. The wooden sphere seen above is created out of Eucalyptus wood and looks rather unique. There are many holes, and crevices that add a distinct look to this sphere. You can plant any type of air plant in every hole and crevice as you like. Believe us, it will look more lively than any other feature in your house! If you have a vacant spot on your walls, and wish to do something creative with it, then, think about using this display idea for sure, as it is not merely eye catching, but also a great way to get introduced to the world of DIY. All you need is an old picture frame, and some hooks and air plants. Attach the air plants on the walls using hooks. Then put the frame around, or else, start with fixing the frame first. Then, follow it up with planting air plants. The frame wall art really looks one of a kind! There is not one, but, an entire gamut of cool ideas to display your gorgeous air plants indoors. How about chucking the usual display wherein you simply hang these beauties from ceiling, and trying something really unique? Well, try this idea of using air plants and candles to form into a lovely looking wreath! It will become the center of everyone’s attention when placed on the center table! 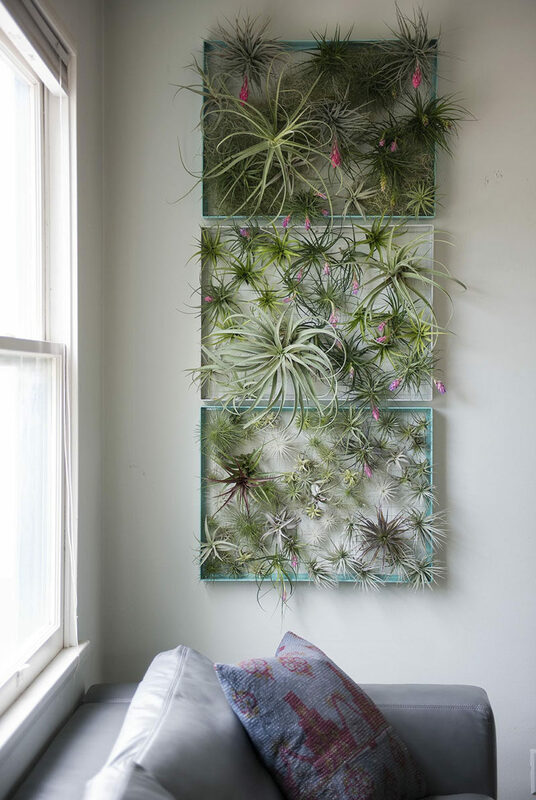 Do you want to try an awesome air plant wall art for your living room? 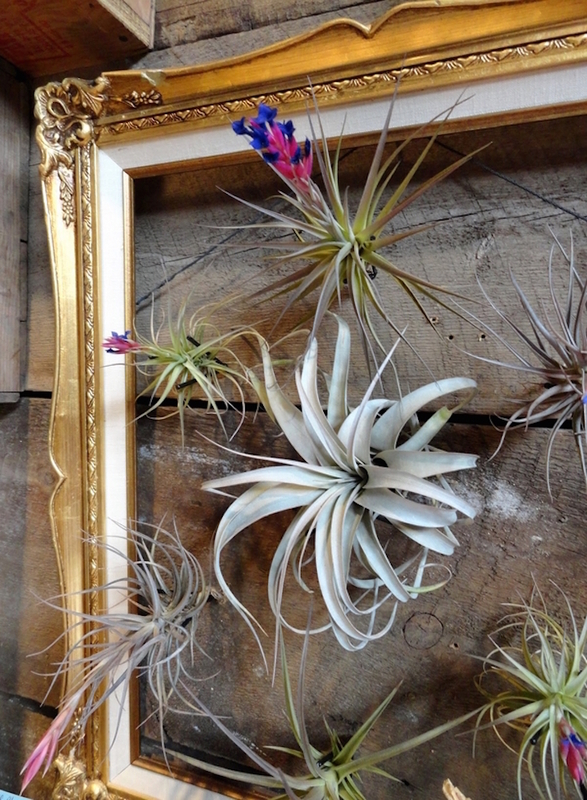 If yes, do take a look at this gorgeous metallic frame art with air plant display. Firstly, gather a few metal frames from your garage or buy from some thrift store. Then, buy your collection of air plants. Fix the frames vertically, one after the other. Then, fix the air plants on hooks that will remain invisible. You are done and…wow…what an art! For those that are DIYers, this project will surely rock their minds. All you need are a few mason jars or bottles, some twine, hooks, stones and air plants. Firstly, attach the hooks on the wall, then, tie the top portions of the jars with twine and attach these with the hooks. Fill stones inside along with air plants and you are good to go. Terrariums are wonderful accessories for decorating indoors as well as outdoors. These lend a more natural feel to your decor. There are numerous ways to stylize your terrariums, such as with air plants, rocks, pebbles and sand. The terrarium decoration above looks colorful with layered sand, and a gorgeous looking air plant placed along with flat surfaced pebbles, shells, and moss. Place these accessories in any way as you like as there are no restrictions what so ever. This idea looks refreshing and is quite simple. You would need round shaped wooden slabs with edges softened. Then, fix hooks for attaching air plants in these. You can arrange these wooden slabs in any sequence as you like. This display is perfect for your office wall or living room wall. These urchins are perfect examples of stunning and one of a kind air plant wall holder ideas. These are crafted using hands, and, for making this project, you will need all natural Sputnik urchins, and air plants. If you cannot get these urchins on your own, then buy these from any online store. Here, the urchins are bought online and measure about 1.5 inches. 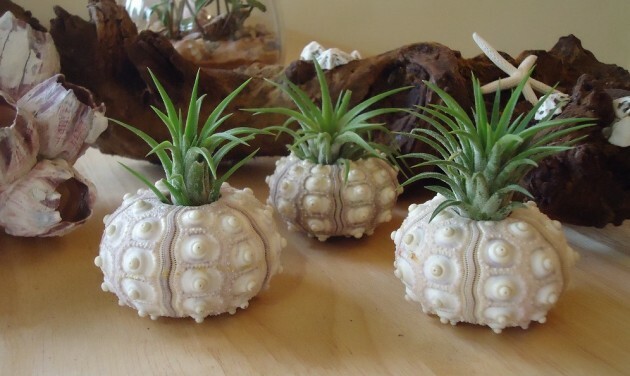 After you have bought the urchins, simply, put these air plants inside them and place these on the console table. Do you have a thing for hanging plants on the wall? If yes, this cradle hanging display will suit you for sure. Buy these terracotta cradles from a store and then hang these using twine or rope. Now, place your air plants using some sort of adhesive. This is quite a unique way to bring in nature indoors. 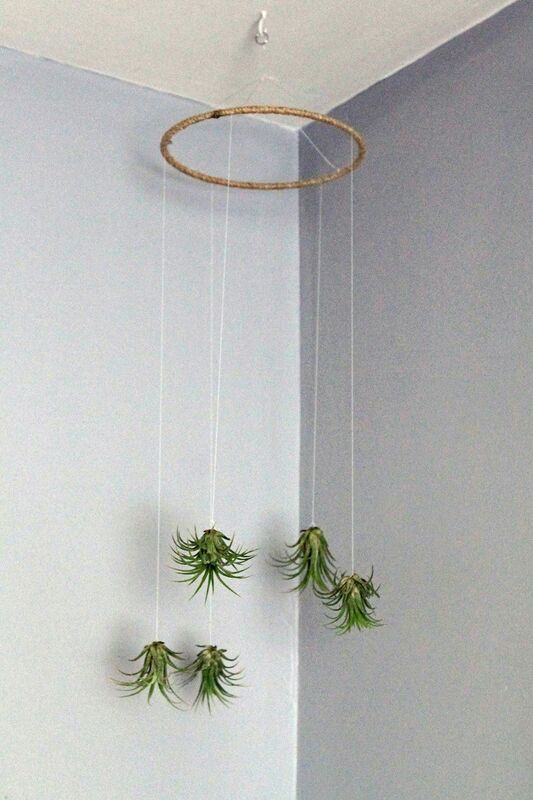 How to hang air plants in such a way that they become the cynosure of all attention? Well, you hang these in stylish copper hangers as showcased above. The hangers are made using copper pipes, wire and strings to hang. Once, you have cut the pipe as per your measurement needs, then, push the strings through each pipe and form into triangles using the wire. Now, hang these from the ceiling or rack. Fill with air plants. These Lego containers will become adorable accessories for any kid’s room. All you need are a few glazed containers, some lego toys and figurines, small rocks and air plants. Here, the home craft project maker has used 3D containers for a unique look. You can place the pebbles first in the containers, then, put the air plants and lego toys. All love ceramic bowls, vases and figurines because these lend a vintage touch to any decor. Now, you can enhance your decor using a charming display of air plants, placed inside cute looking ceramic vases or figurines. In this picture above, the table is decked up using a ceramic bird air planter. Stack the place up with books or other accessories if you want. Creating these marbled clay pots is simple. Mix two shaded clay together, preferably black and white. You have to roll these flat. Now, cut off a circle using a cutter. Press down to form into a shape. Then, make holes followed by trimming off the edges using a cutter or a knife. You will get a stylish clay pot with marbled effect. Place your air plants as the last step. Ocean themed decorations are always loved as these help bring an element of under sea experience to your decor. The sea shells seen here are actually fridge magnets that can also act as air plant holders. The tiny air plants look gorgeous in these shells. You can get your hands on these sea shells in any store that sells such stuff. This is one DIY project that will add a mojo like you have never seen before. You will need to get a few things like bamboo skewer, polymer clay in white, some air plants and golden colored paint. Firstly, you have to shape the clay and create a hole using the bamboo skewer. Then, bake the clay after which, you have to paint the desired patterns using golden paint. As the last step, place your air plant gently. You can craft as many clay pots like this and each time, you have the freedom to try out new patterns. This is an amazing air plant display which can help to enhance the decor of your home without you having to spend a bomb. The hanger is made entirely of wool. You can also try knitting this woolen hanger as its not difficult at all. Or, else, buy it from any online store that will sell you similar looking woolen holders in different colors. Once, you have made or bought the desired woolen hanger, insert your air plant into the hole at the bottom of the hanger. This is an old Champagne riddling rack that has been converted into a stylish air plant wall holder. The rack is made out of rustic mango wood that has a knotty texture to it, and comes with D-rings for helping you put the rack on the wall. 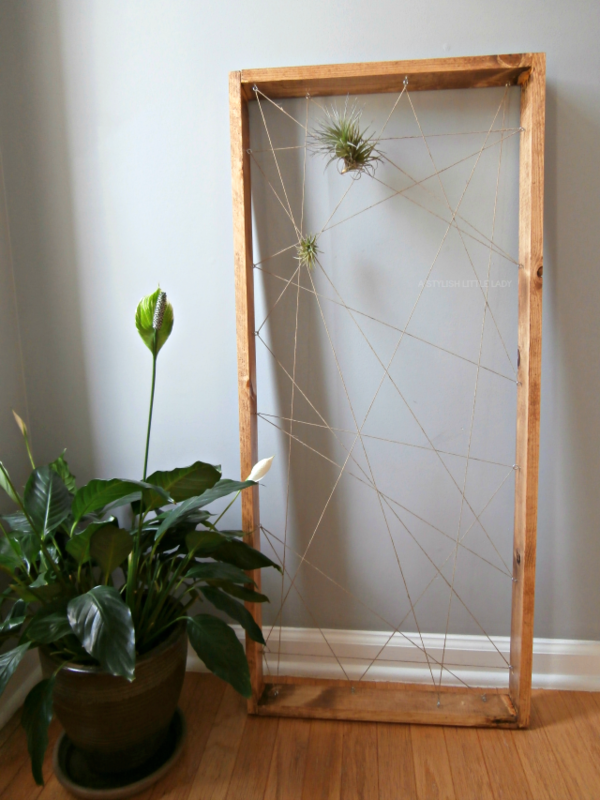 Once, you have attached the rack to the wall, its time for placing the air plants in the holes. You can also place moss. Wish to add a rustic tone to your home decor? 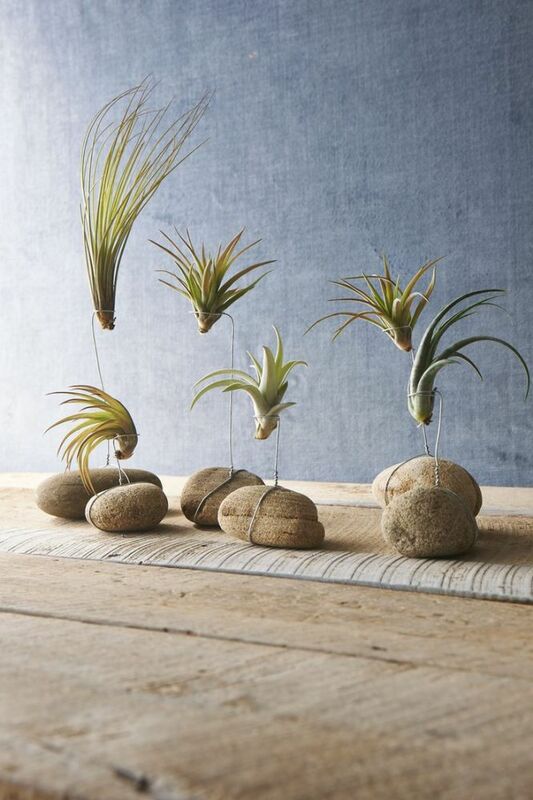 Well, try using this amazing DIY idea that involves river stones or pebbles, wire to hold the air plants and some beautiful air plants. If you can get gauge wires, it would be a better alternative as it will hold your air plants upright. Simply, begin by wrapping your wires around the stones in the form of a loop. And, then, place the air plants inside them. 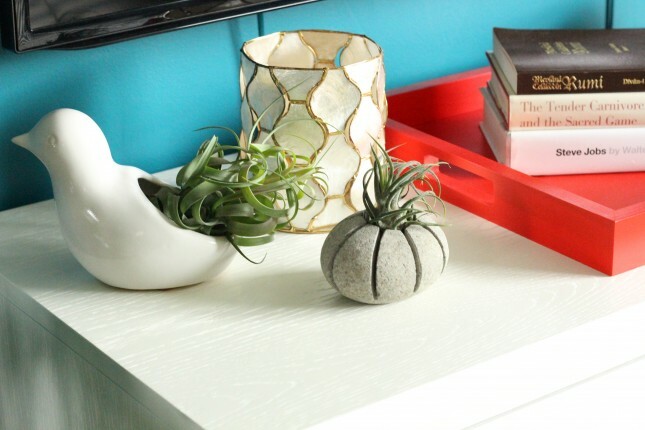 This is an easy breezy way to deck up your rooms with air plants. All you will need are glass vases or containers or bottles that have a vintage touch to them. Then, simply fill in air plants, and you are done. These jars can be placed on the console or center table as centerpieces. Wrap the jars with some form of decoration as you like. Here, they have wrapped one vase with knitted wool. This visually stunning wall frame art is a must to try at home. Its easy and looks terrific when placed on a vacant wall. You will need to collect a wooden frame and driftwood. The driftwood has to be fixed inside the frame suing nails, and then, its time for placing air plants in the crevices or craters of the driftwood. You are done for the day and what a job! Christmas ornaments like baubles and fruit shaped bowls and balls are quite popular in decorations worldwide. Seen above are two glass ornaments in pear and apple shapes. These have been filled with sand and air plants. You can either place them on tables, or else, hang these using twine or ribbons. 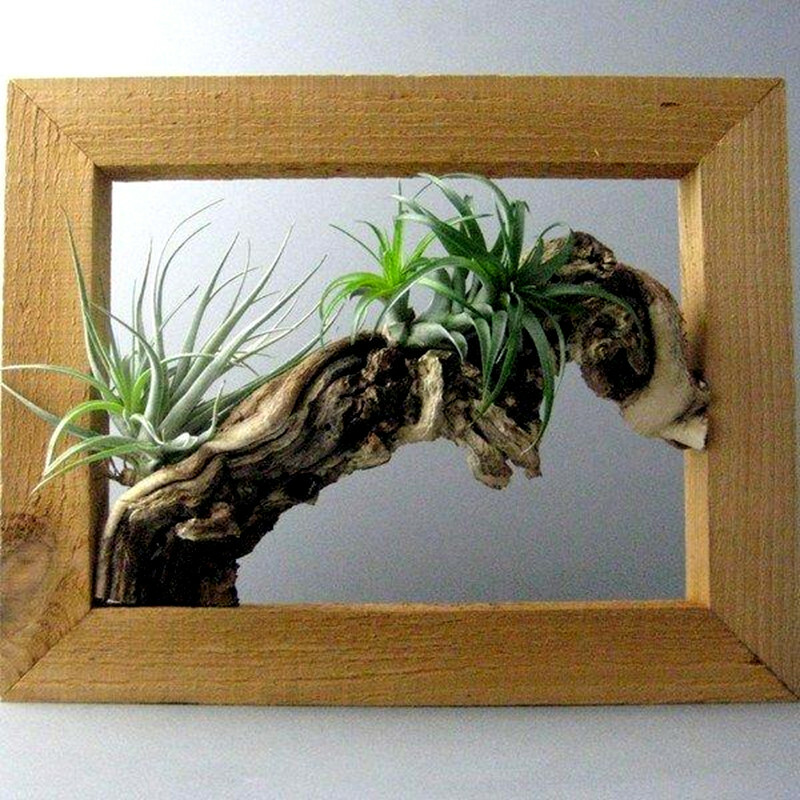 These wooden frames look stunning as these are designed with string art and also hold charming and exotic air plants. The art shown above is mind blowing and can be done quite easily, provided you have a few wooden boards, hammer, air plants, nails, scissor, and strings of various colors. Once, you have all the material, start by drawing some design or shape on a paper. Now, do the same on the wooden boards. Drill the nails onto the design you have made using hammer. Now, start tying the string from one corner and finish it till it reaches the other end. This will have to be done so as to create a string frame design. Once finished, place your air plants inside the web design. 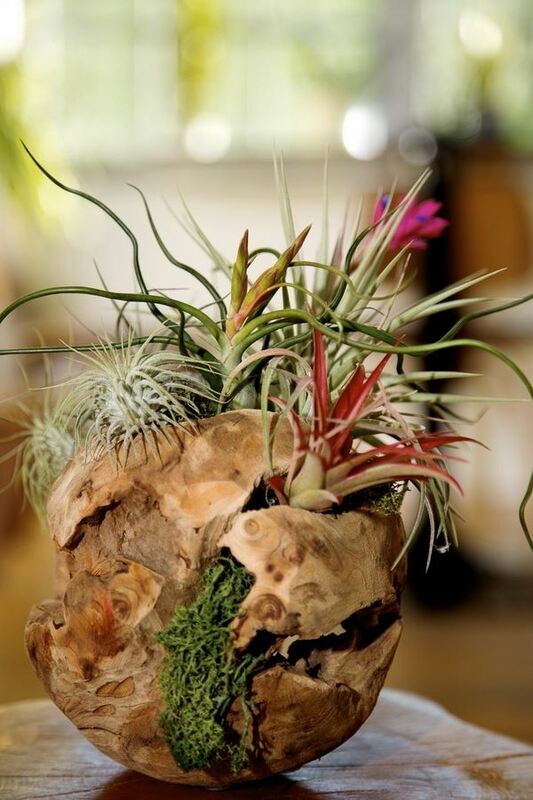 This type of air plant displayed in the wooden holders is called Medusa air plant. It looks exotic and can feature anywhere indoors. The wooden holders can either be made at home, or bought from stores. Simply, pass a gauge wire through the hole drilled on the top of each holder. Create a loop and then, place your air plants in these. You don’t have to be a genius for thinking out of the box ideas for home decoration. 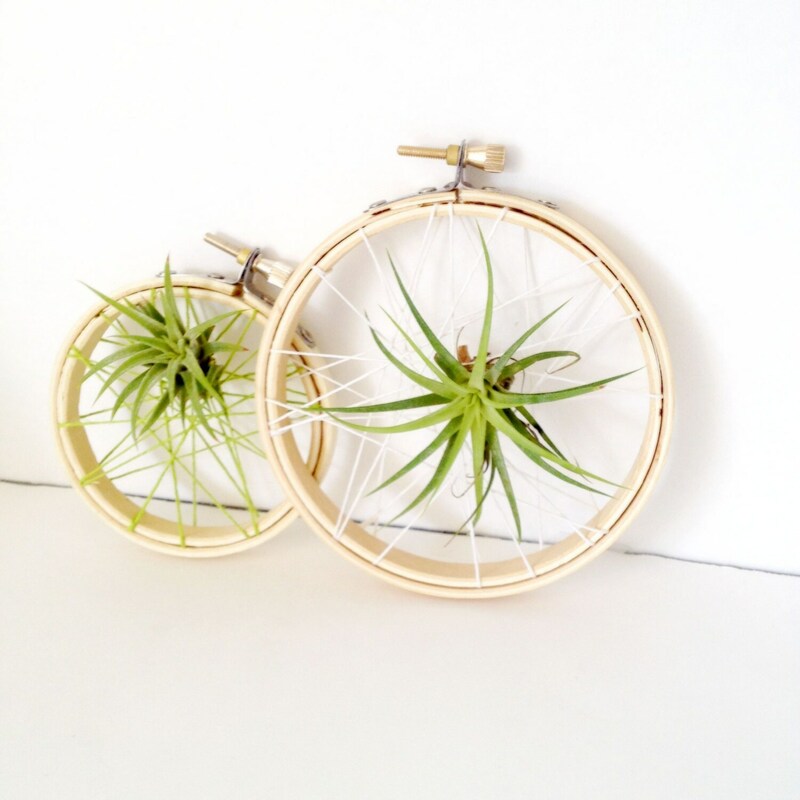 You can craft out your own air plant display holders with simple things like embroidery hoops. 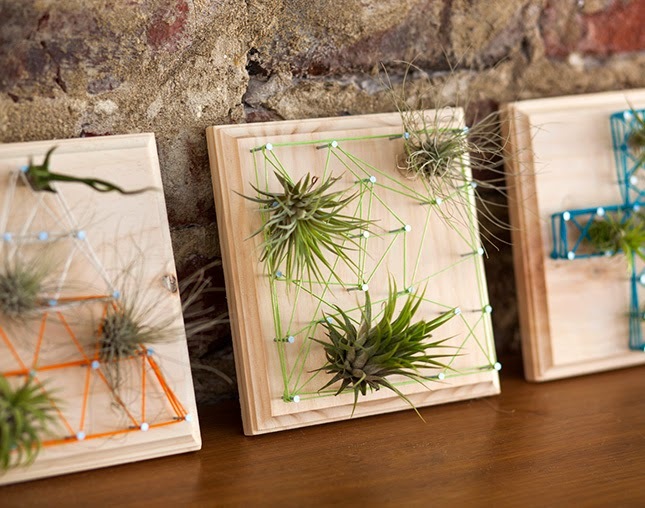 These look adorable and offer a great frame work for displaying anything exotic such as air plants. For this particular display art, you would have to gather at least two embroidery hoops, some colorful hemp cord and air plants. Wrap the cord across the hoop in order to make a patterned web. Once done, place your air plants in these webs. Are you searching for quirky and charming air plants decoration ideas to be used on your windowsills or office desks? 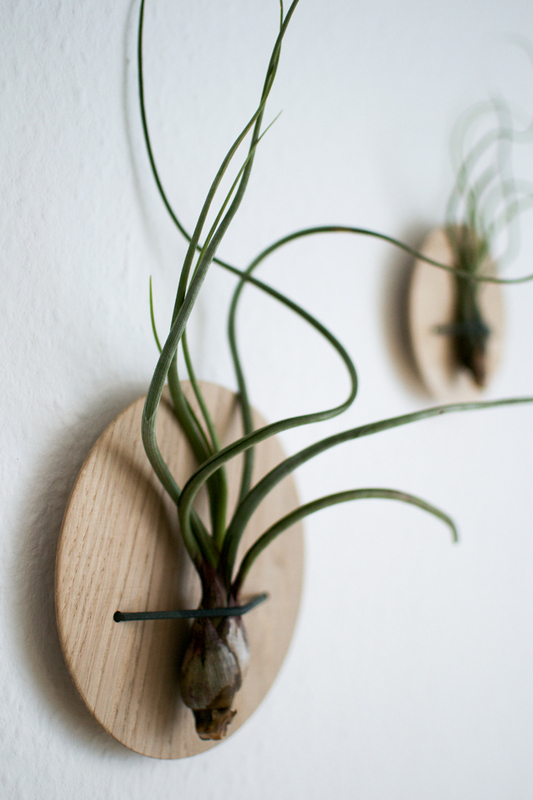 If so, then, take a look at these awesome wooden slab air plant holders. These cuties are rustic in nature and can be crafted by amateurs. These can help you enliven any area with ease. The above shown wooden slabs are made from Cholla wood and look unique with natural dents and crevices. Air plants can fit inside these holes easily. 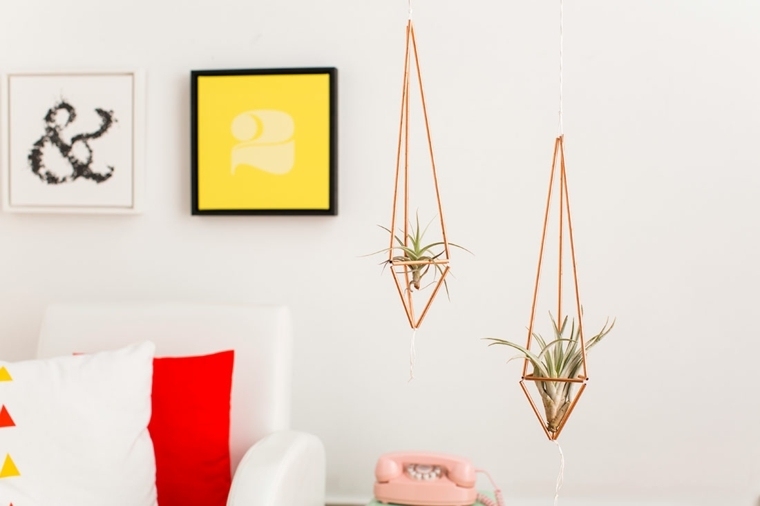 How to hang air plants in style, such as in the image shown above? If you are looking for answers, here is an easy way to do it. All you need are some terrariums or glass ornaments of various shapes and sizes, some twine or hemp rope for hanging, air plants and hooks. These hanging holders can brighten up any corner, such as your living room or sitting area. Also, it is super easy to place the plants in these glass ornaments. It’s a simple way to add style to your interiors! Natural is always loved, and when, speaking of natural, we must mention about wooden elements. The wooden hanger seen in the picture looks very charming and can be used for displaying air plants in a quirky little way. Start by purchasing a wooden holder. Collect air plants that you wish to display, some sea shells of varying shapes, and moss. Once, you have placed all these things inside the wooden holder, drill hooks on all the four corners, and then, pass rope to hang it from the ceiling or some rack. The tiny cone shaped hangers, measuring just 2 inches, seen in the image look adorable. These are crafted out of ceramic, clay and porcelain. The glaze effect seen on them lends a charming touch. These cone hangers are handmade and are available for sale in many online shops. These look elegant and can liven up any corner indoors. A truly elegant piece to freshen up any spot indoors is this gorgeous wooden frame holder with webs. The frame can be purchased, or, can be re-purposed using old painting or picture frame. The webs are made using strings. The air plants are lodged in the web and look really charming. This is an stunning example of a noteworthy wall art. Here, the wall of a home looks ethereal, thanks to this elegant air plant holder boasting of two wooden elements gelled into one. The main body or frame is made of rustic wooden slab, and the other decorative element is made of branches. The contrasting look of these two makes this wall art simply astounding. 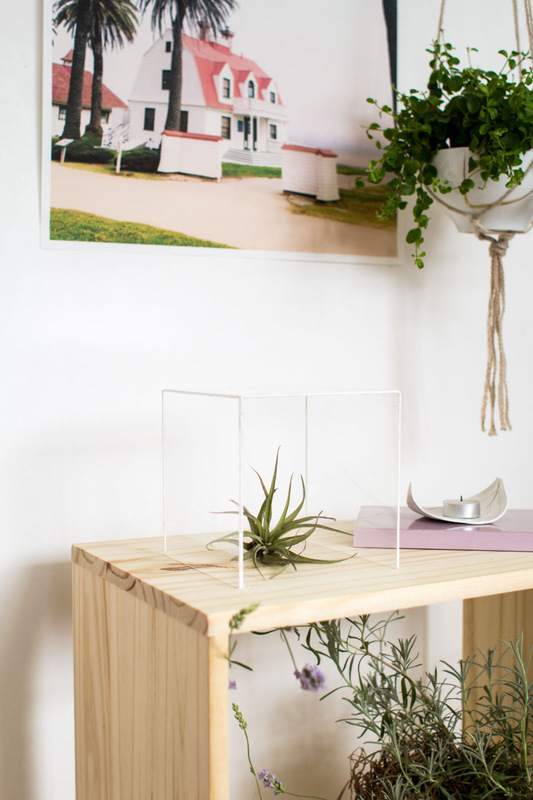 You can place your air plant on any twig and …you are done! Wire holders come in different shapes and designs, and it is you who has to decide which design to choose. 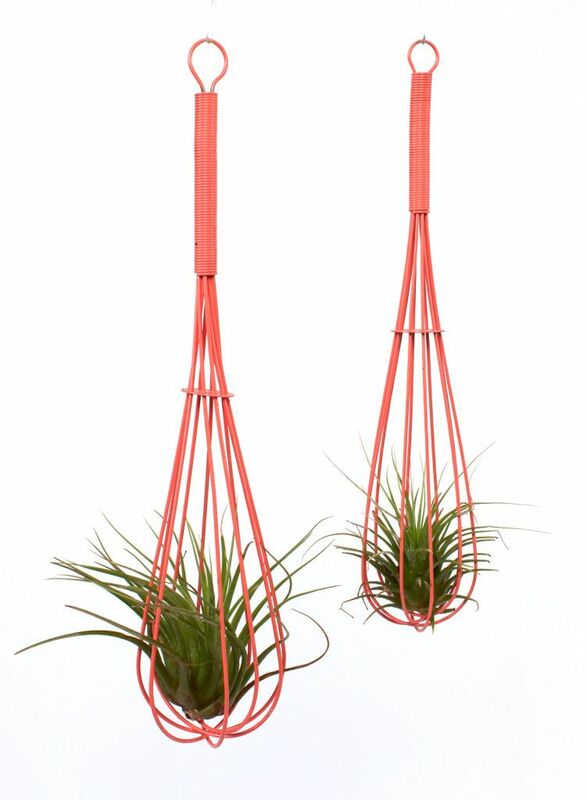 In case, you have a vertical wall, you can spruce it using these lovely looking wire air plant holders, as seen above. These spiral designs lends a dash of elegance to the wall. Arrange the holders in any pattern as you like. These wire holders are sold at numerous stores and are quite reasonably priced. 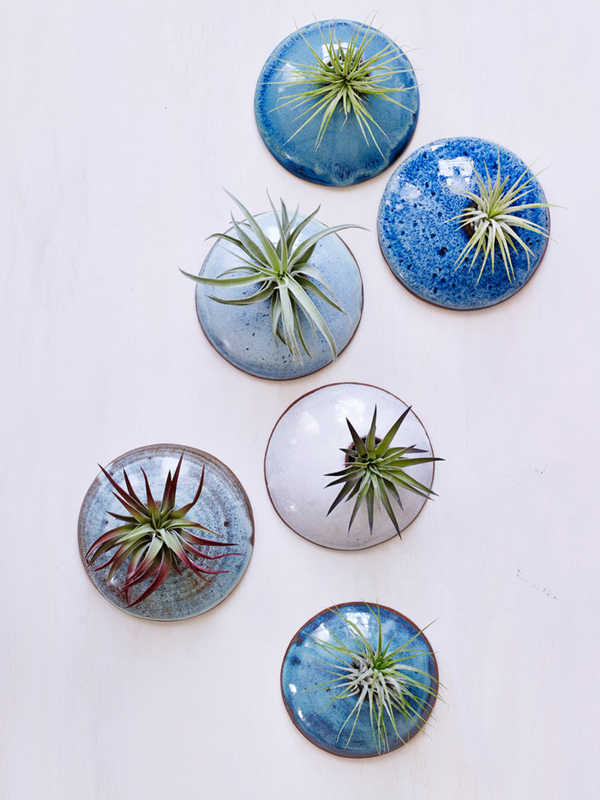 For a fantastic air plant display on your living room table or some corner spot, choose these concrete holders over anything! These concrete roundel holders in pastels look extremely elegant and are perfect to be showcased on a vintage themed table in your house. Simply, choose some concrete bowls or pots that you can buy from anywhere. Then, color these up with any pastel shades that you love. Also, gather vertical shaped concrete bricks and paint these as well. Now, plant air plants in these pots, and layer them over each other randomly. Its a great example of breaking a monotonous pattern. Metal holders such as copper have a distinct beauty. You all can use copper as holders for your air plants, thanks to this lovely idea presented above. 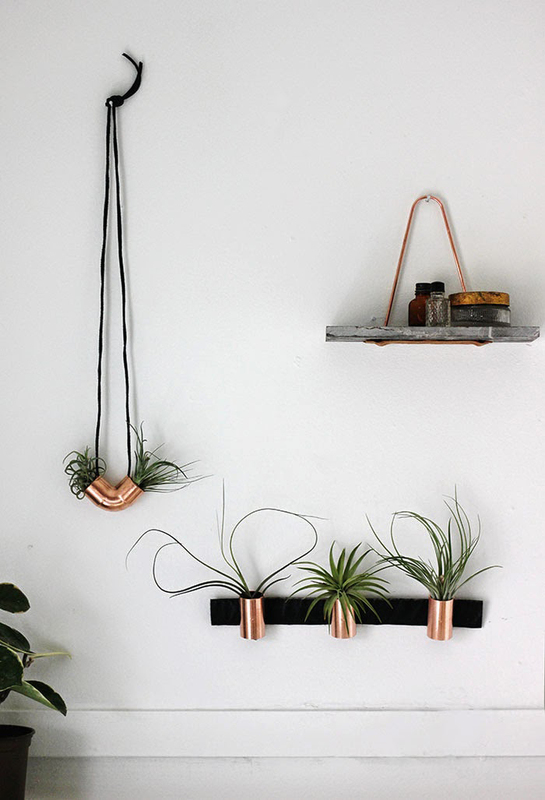 Here, the DIYer has used copper tubes for turning these into awesome plant holders. Begin by collecting a few copper tubes or couplings, a hammer, a piece of leather, glue and air plants. Once you gather these, start by cutting the couplings into the size that you want using a cutter or an electronic tool. Use a hammer for denting one copper coupling that you want appearing different than the others. Now, take a piece of leather and put glue. Then, stick or paste the couplings on it. Afterwards, using a heavy duty glue, stick the leather piece on the wall. Now, place your air plants in them. For the dented coupling, you have to put a string through its holes and hang it with both ends displaying air plants. You can create any type of air plant wall art with the help of your imagination and some searching for cool ideas. How about picking an ocean themed idea for displaying your air plants? If you have already seen the image here, you will probably get an idea as to how to go about the whole affair. Simply, buy a couple of glazed clay wall planters that are hand made by potters. The holders seen above are 4.5 inches in diameter and make awesome decor accessories. These come with holes for easy mounting on walls. You can place any type of air plant in them as you feel. Mobiles can become the next big thing as far as air plant display ideas are concerned. This is because these look cute and are ideal for kid’s room decoration. The picture above shows how you can turn a spot in your house into an artistic zone when you hang mobiles with air plants displayed on their strings. This is an easy DIY craft. 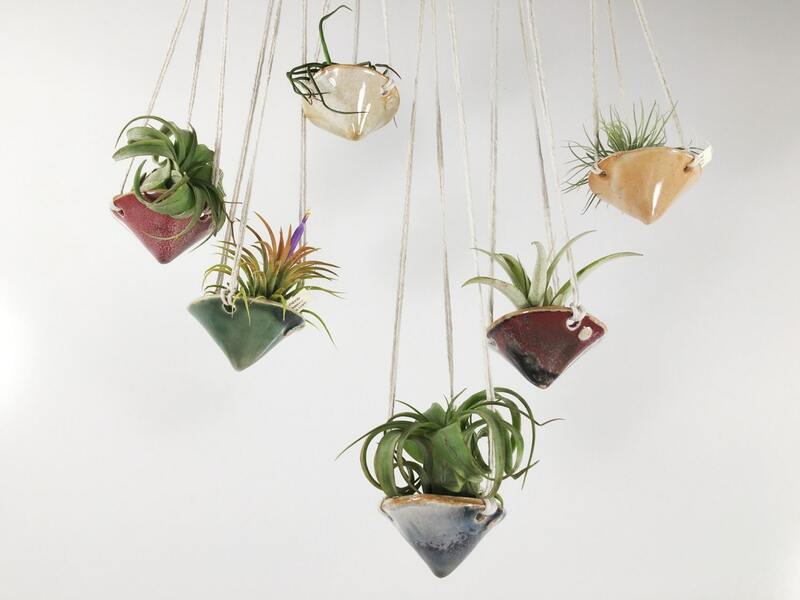 You have to buy a mobile and then simply, hang air plants from its strings. 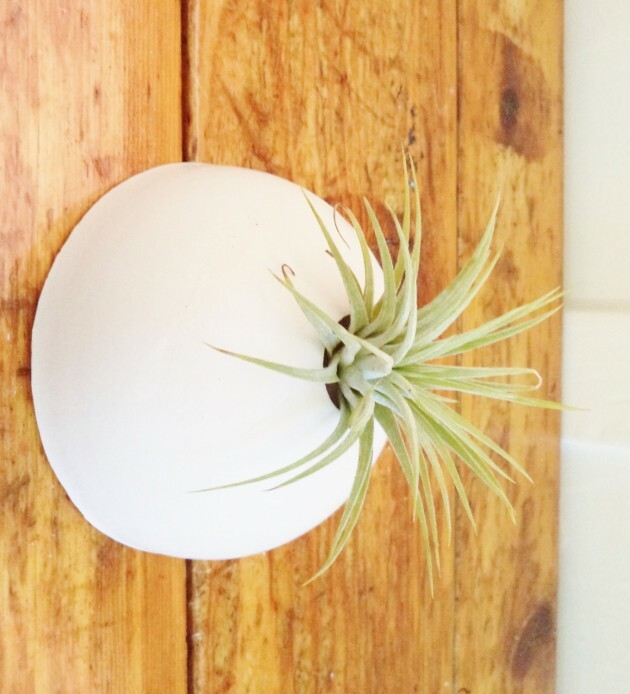 Turn your kitchen tools into trendy air plant holders with this awesome idea shown above! This is a very easy job wherein you have to get hold onto some colorful whisks and then place air plants inside. Hang these from stings. For an extraordinary display, try out this cool and cheap idea today. Many of today’s showcased air plant holder ideas allow you to craft your own display holders at no cost. One such creative idea is to make use of ordinarily available things like newspaper, flour, strings, paint and balloons. Start by blowing balloons to the size that you want for the holder. Then, in a separate bowl, add newspaper strips, flour and water to combine into a mixture. Afterwards, dip the balloon into this mixture and dry. Once dry, the balloon has to be burst so as so get the paper mache pod developed over it. Now, paint the pod with white or any other color that you like, followed with passing a string through a hole drilled on top of it. Lastly, place an air plant of your choice. Felt can also become an attractive accessory when used for decorating bowls for plant displays. 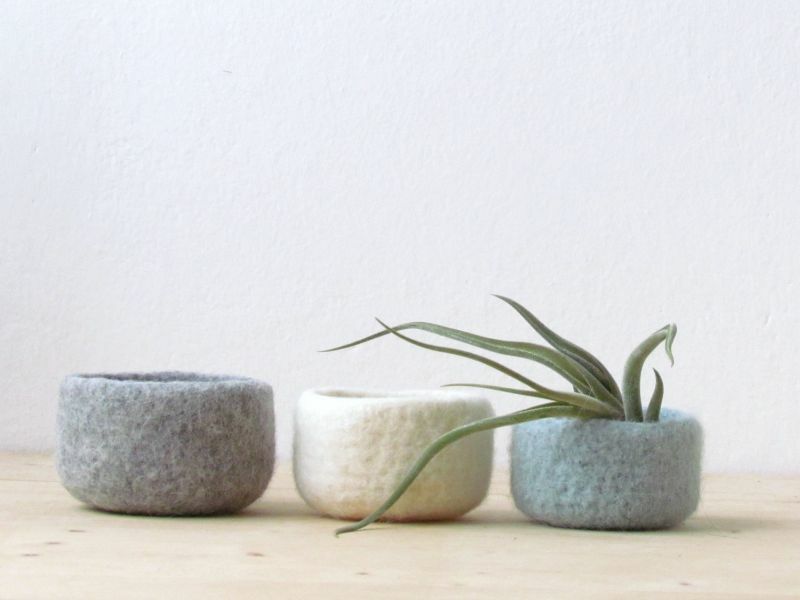 Seen here are a few bowls wrapped in felt, one among them displaying an eye catching air plant. These woolen bowl holders are perfect for winter decorations. You can, of course use bright paint for this purpose. This is a fun project that can be done using very ordinary things like straws, paint and wires. Start the project by first cutting the straws to your desired length. Then, take the wire and shape the straws to resemble a triangle or some other geometric design. Hold the entire shape together using a string. Now, paint the straws in one color, or, if you want, leave the painting part, and use the straws as they are. As the last step, place your air plants inside using strong adhesive. If you are hard pressed for time, but are always craving for creating new decor things, then, this idea is just for you. Use perspex sheets cut into halves for this project. Cut out similar sized sheets numbering four, and then, join the edges of each other with strong adhesive, so as to create a squarish box. Only, leave the front part of the box open, so as to fit inside an air plant. Place the plant of your choice and you are finished for the day! This is a string display of an air plant and looks extremely funky. All you need to do is gather some sating cord or string in black shade, glue and balloon. Fill your balloon with air to a size as required. Now, wrap the cord with glue and place it over the inflated balloon. Then, hang the balloon with the cord glued over it. Once dry, pop the balloon. You will see the cord in the shape of the balloon once its deflated. 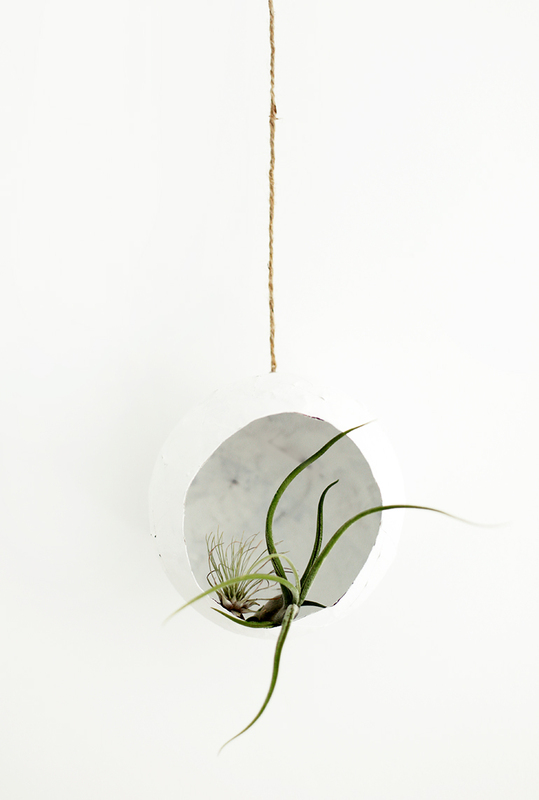 Now, place an air plant inside it and hang it wherever you want. Old wooden picture frames come to your rescue often, and always become the ‘best’ accessories of decor in your homes. For crafting this project, you will need an old wooden frame with ornamental curves, air plant or plants, nails, hammer, string and a scissor. Start by hammering nails on the sides of the frame, and then, use the string to form a design called ‘Cat’s Cradle’. Once the design is wrapped around, place your air plant. Sand and air plants look cute and stylish together. 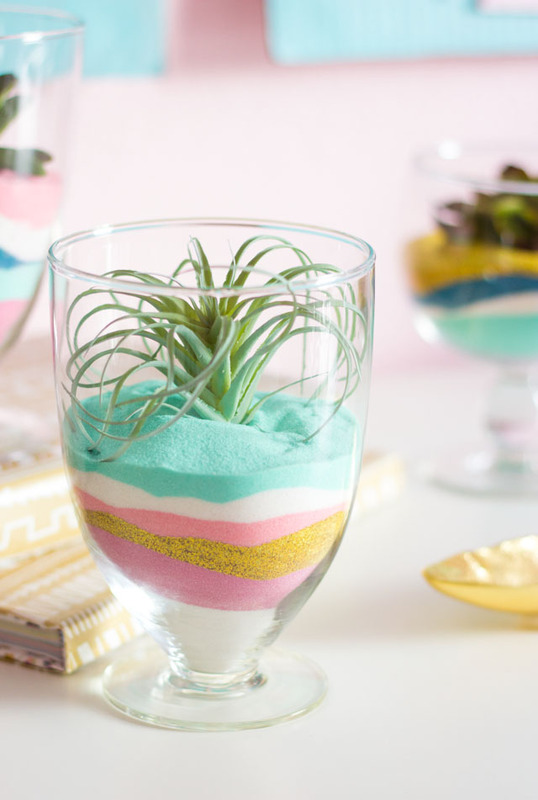 Now, you can craft a very easy DIY project using sand, a glass goblet or jar, and an air plant. Simply, collect an attractive looking glass goblet or jar. Color the sand in three to four different shades of any color. Buy an air plant. Now, fill the goblet with sand in layered form. Lastly, place an air plant inside. Its an extraordinary project and a cheap one too! Crystals are known to have purifying properties. And so do air plants as they help to purify the surrounding air. The above showcased air plant display in crystal looks simply astounding and appealing. Buy any colored crystals for making this DIY project. Add some adhesive to the air plant’s bottom, and then, gently place it over the crystal. For the succulent, put some soil in one of the holes and plant it. Create as many crystal holders as you feel and in different colors too. Its again a simple and no cost DIY project in which you have to create a rocky display of air plants. Collect a few uneven or similar shaped rocks and pebbles with various textures and finish. Stack one on top of another, and then, place air plants on the top. Done. The best part about using these rocky displays is that they can be used as decor features and also as paper weights in your study. The above presented air plant wall holder is crafted out of galvanized chicken wire made of steel, and looks stunning on a wall, resembling a heart. You have to first, cut the wire using a cutter before which you need to trace the heart design. You can also use pliers for this purpose. Once the heart shape is cut out, paint using any shaded spray. Now, place the air plants in the wire holes. Such an exotic display can enhance the look of a decor in an instant. 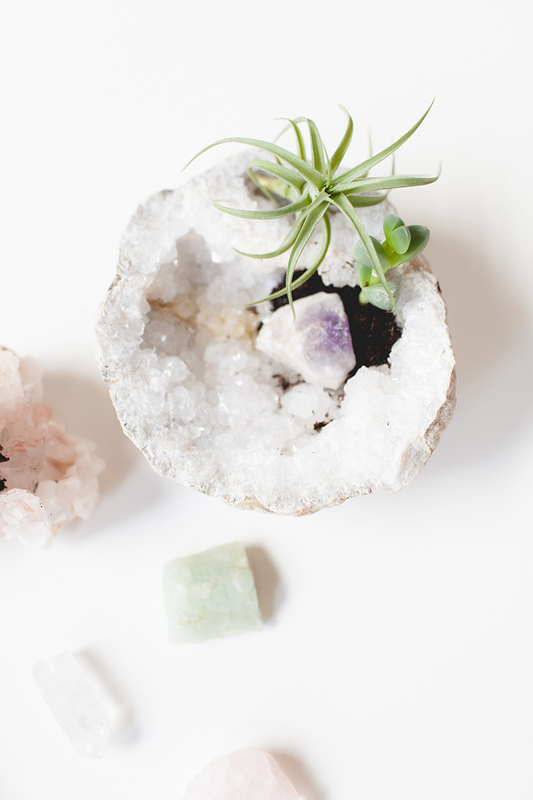 You can make it easily with some things at your disposal, like pebbles or rocks, air plants, a baking dish, and crystals or quartz like Amethyst. Simply, start by placing rocks on the baking dish, then, arrange your air plant together with the quartz or any other accessory that you would like to display. The arrangement can then be displayed on a living area console or center table. This air plant holder is crafted out of a simple glass ornamental pod, mod podge, air plant, and glitter. Mix a variety of glitter in a bowl, and then, apply some mod podge on the glass pod. Now, sprinkle glitter mixture all around. Dry and then hang it using a string or cord from the ceiling. Industrial theme is quite popular these days with everyone going for industrial inspired decorations. Seen here is an electrical insulator turned into an air plant display holder. Try getting an old insulator and a galvanized coupling from a hardware store. Then, fit the insulator inside the coupling. Now, place the air plant inside. Easy! Hope you loved reading our post that listed stunning air plant display ideas, and we wish you will surely try a couple of these soon!